Let’s face it, music is as much a part of Mardi Gras as Zulu, Rex and hangovers. Not surprisingly, the majority of classic Mardi Gras songs were recorded during the golden era of New Orleans rhythm and blues, roughly the late 1940s to mid-1960s. The brass band revival of the 1980s provided a few Carnival musical highlights, but it’s been a long time since someone has written or recorded a Mardi Gras song that has really captured the public’s attention. Why? “I don’t know, but there sure hasn’t been one in a while,” says James “Sugarboy” Crawford, laughing. Crawford accounted for the Carnival classic “Jock-A-Mo.” “Maybe it’s because Mardi Gras is too civilized now. When I wrote ‘Jock-A-Mo’ over 50 years ago, the (Mardi Gras) Indians carried knives and hatchets. When one tribe got in another tribe’s territory, they started fighting. Now it’s pretty much a fashion show for them. Warren Hildebrand heads up Mardi Gras Records and released Mardi Gras in New Orleans, the first full album of Mardi Gras songs, in 1977. He agrees that there hasn’t been an identifiable Mardi Gras song to come along in some time. “That hasn’t stopped people from writing and recording them, though,” he says. “There’re new ones almost every year. In fact, a guy pitched one to me just today and I told him I’d give it a listen and see if it’s good enough to put out next year. The last really identifiable Mardi Gras song I remember was Rebirth’s “Do Whatcha Wanna,” and that came out 20 years ago. Some of these songs were on Hildebrand’s album; others should be. Penned by Earl King, and recorded by Professor Longhair in 1964, the inspiration for “Big Chief” wasn’t the Mardi Gras Indians, but rather King’s mother. “I wrote ‘Big Chief’ back in school,” recalled Earl King in 1982. “When we went to work on this project with Professor Longhair, I got to thinking about the Mardi Gras, and went back to my book. “The lyrics say let them (the clubs) burn down, but the places weren’t really on fire—I just meant that people there were having a good time. Released right before Mardi Gras in 1960, the single didn’t do much at the time, but in later years, its popularity increased. Now Carnival wouldn’t be complete without it. The Hawketts were a group of teenaged musicians led by vocalist/ keyboardist Art Neville. Their version of “Mardi Gras Mambo” was a cover of a string band recording, originally recorded by Jody Levins. The Hawketts’ version was produced by New Orleans disc jockey Ken Elliot a.k.a. Jack the Cat at radio station WWEZ. He in turn leased it to the Chess label in Chicago. 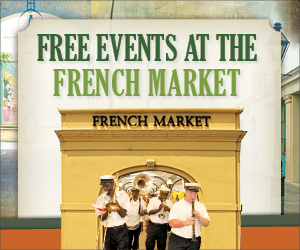 It was an instant hit on the streets of New Orleans. Two decades later, it was covered again by the Meters, a group led by Art Neville. “I’m not singing ‘Jock-A-Mo’ on that record,” specified Sugarboy. “I’m singing ‘Chock- A-Mo,’ The label (Checker) misspelled it. But after it came out, there was nothing I could do. “Jock-A-Mo” proved to be a local best seller prior to 1954’s Mardi Gras, but was forgotten by Ash Wednesday. However, for two weeks every year since then it renews its popularity. While “Second Line” has become a marching and brass band favorite, the song has rhythm and blues roots. Bill Sinigal was a popular R&B saxophonist/bass player. His trumpet player, Milton Batiste, played R&B and Dixieland music. Recorded on Cosimo Matassa’s White Cliffs label in 1963, the single did well locally during Carnival until White Cliffs folded in the late 1960s. The master disappeared and no more singles were pressed. Record stores still got requests for the song and it was covered by a group from Baton Rouge, Stop Inc., on JB’s Records in 1974. Sinigal’s version has since been reissued by Universal, but the Stop Inc. version has supplanted the original in popularity. “Meet the Boys on the Battlefront” was a virtual plan for a Mardi Gras Indian tribe on Mardi Gras day. The Wild Tchoupitoulas was a 13th Ward tribe led by the spirited George Landry a.k.a. Big Chief Jolly. Besides his tribal duties, he played a mean blues piano and was an inspiration to his nephews, the Neville Brothers. In 1976, Art Neville thought recording his uncle singing traditional Mardi Gras Indian songs with his band the Meters, and his brothers, might be a good idea. Turned out it was, as The Wild Tchoupitoulas album is a classic. The album contained “Meet De Boys on the Battlefront,” where Landry bragged about how pretty and tough his tribe was. This was an R&B instrumental recorded for NOLA Records in 1965 that has since become a brass band favorite. Johnson’s single enjoyed brief local popularity but exploded when the young brass bands evolved two decades later. Now it’s played by nearly every brass band and high school marching band in New Orleans. The city’s premier funk band, the Meters, recorded this on their 1975 Fire on the Bayou LP. “They All Asked for You” came from a century-old nursery rhyme often heard on the streets of New Orleans. It was originally recorded in 1952 by Paul Gayten as “They Asked for You (Down at the Zoo).” The Meters borrowed it, created some new lyrics, added a syncopated second-line rhythm and created a Mardi Gras classic. 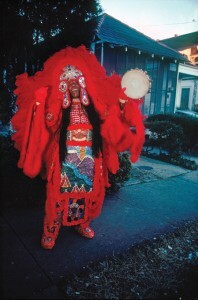 In a city of wonders, perhaps nothing is more wondrous than the Mardi Gras Indians tradition. In addition to marching through the streets in stunningly elaborate homemade suits, some of the tribes have recorded some very popular Mardi Gras music. One such tribe was the Wild Magnolias. While these two songs have been long associated with each other and were released on same album in 1976, they have completely different origins. “Handa Wanda” was produced by Quint Davis and recorded in 1970 at the Deep South Studio in Baton Rouge. It was Davis’ idea to back up the traditional Indian chants with contemporary New Orleans musicians, and he put together a stellar band that included Snooks Eaglin and Willie Tee. 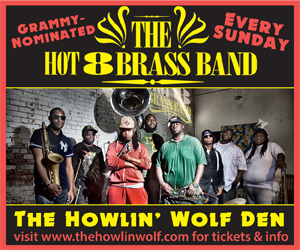 The single appeared on Davis’s Crescent City label and became a Carnival best seller. The entire tribe is listed as writers of the song, including their Big Chief and lead singer, Bo Dollis. “Handa Wanda” drew the Wild Magnolias to the attention of a French record producer, Philippe Rault, who had relocated to New Orleans. Rault signed the tribe in 1975 to Barclay Records, enlisting most of the same musicians from the earlier session. He brought them all to Studio in the Country in Bogalusa, where the Wild Magnolias recorded the Willie Tee-penned “New Suit.” The song became a popular single on jukeboxes across Central City. Does anybody know of Phillipe Rault’s whereabouts? I was so fond of Phillipe and lost track over the yrs. (’67- ’74). I would be most grateful if anyone could help m e find him.